Cars and trucks have many ways of communicating problems to the person behind the wheel. As that person it is important that you pay attention to what your car is trying to tell you and get to the repair shop as soon as possible. Putting off auto repair is only going to let the problem grow worse and more expensive to fix. If you encounter any of the following signs of car trouble get to the repair shop immediately. The check engine light is the most common dashboard indicator light, but your car is equipped with several others. These include the tire pressure monitoring system (TPMS) light, anti-lock braking system (ABS) light and others. If any dash warning lights come on get to the repair shop for proper diagnostics. There are many ways a car or truck can struggle to perform. If you experience decreased fuel economy, a rough idle, stalling, harsh acceleration, hard starting or other similar problems you'll want to schedule service. These issues are often solved with a minor tune up! Many car problems create sounds that should clue you into the trouble. For example low brake pads will result in loud squealing noises when you hit the brakes. Another issue would be a clicking sound that replaces the engine starting when you turn the key, which is a sign of a failing starter. Is your car shaking and shimmying? That's no good. Common car problems that cause vibrations include poor wheel alignment which will cause the steering wheel to rock back and forth or the gas pedal may vibrate if there is an exhaust leak. Smells that develop as you drive are a common symptom of car trouble. A few of the more common ones include a gym bag smell that blow from your AC and heater, indicating mold in the vents, or a maple syrup smell that often points to a coolant leak. If your car is giving you any sort of trouble don't hesitate to have it checked out before the issue gets worse. 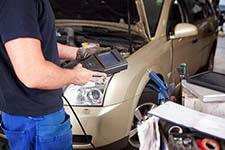 For expert automotive diagnostics in Katy, TX, head to Auto Check on Kingsland Blvd. Our dedicated auto repair techs will have you back on the road in no time, regardless as to the trouble at hand. To schedule professional auto repair in Katy give us a call at (281) 815-2351 today. Does My Car Need a Wheel Alignment? What does excessive exhaust smoke mean? Does My Car's Starter Motor Need Replacement? Do I Need Alternator Replacement?